Safe Showers is the company that homeowners throughout the Fredericksburg, Texas, area turn to for bathroom updates that make bathing safer and easier for loved ones who are disabled or aging at home. Unlike other bathroom remodeling contractors in the area, we’re not just trying to sell you a product – we are 100 percent dedicated to helping those in need live more comfortably and independently in their homes with walk-in tub and wheelchair-accessible shower installations. The walk-in tubs that we install have a low step-up entry and the only truly slip-resistant floor in the industry, which all but eliminate the risk of slip-and-fall accidents. After you enter the tub, it will fill quickly with delightfully warm water, and you can sit back and relax as hydrotherapy jets soothe your aches and pains away. 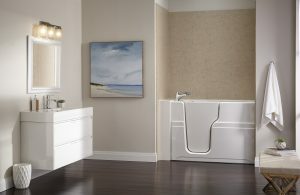 The roll-in showers installed by Safe Showers have low- or no-wall options for easy entry and exit, and they include three grab bars for extra support. We’ll also include a shower chair for no additional charge – a feature you’d pay extra for with other bathroom remodeling contractors. And, your new walk-in shower will be completely customizable with a wall surround, showerhead, and storage features to provide a fresh new look for your bathroom in Fredericksburg, TX. When you partner with Safe Showers, you can expect nothing but the highest-quality craftsmanship from our installation team. We’ll have your new walk-in tub or roll-in shower installed in no time – we’re proud to offer the fastest turnarounds in the area – to minimize any inconvenience, and we’ll back your project with a one-year labor warranty and lifetime product warranty. To learn more about how we can make your bathroom in Fredericksburg, TX, safer with a tub-to-shower conversion or shower or tub replacement, contact the bathroom remodeling contractors at Safe Showers today.